I know that I shouldn’t shout; but I just want to tell the whole world that I’M REAL! I’M HAPPENING! I’M A REAL ELEPHPANT! When Mark got home from work this evening, he found me sitting in my travelling box, just waiting for him to arrive. The picture doesn’t really do me justice, the lighting makes me seem darker than I really am (I’m really a bright and cheerful soul), so I’ll sort out some better pictures of me in natural light tomorrow (or over the coming weekend). When I do, you’ll see that I’m a little different to those original photos of me from back in June: the factory clearly took note of Mark’s comments back then; and (even though I do say so myself) I look even better than he’d ever imagine that I would. And (of course) this final prototype me has my PHP logo and my toes. But the final arrival of the prototype me is just the latest thing to happen. It’s been a very busy week, with all manner of exciting things happening, as the launch of my kickstarter project approaches at a rush. But before I talk about my kickstarter, what else has been happening this week? 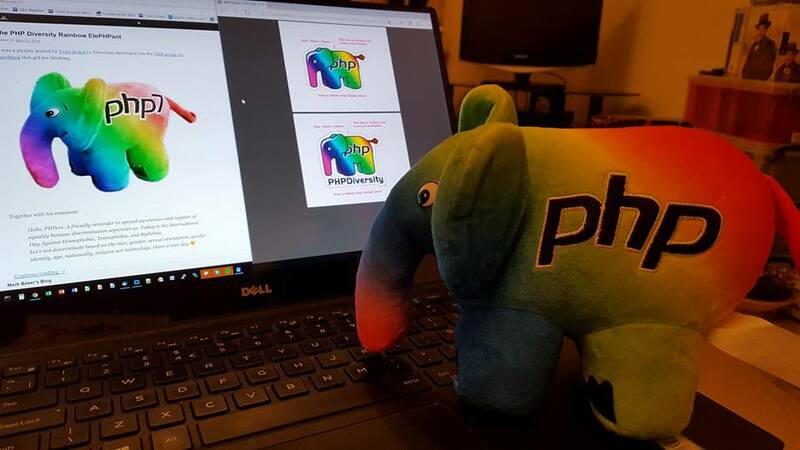 To start with, I now have my own domain (PHPDiversity.org) and my very own email address (enfys@phpdiversity.org); and Mark is putting together a website for me, based on the work that Ashley, Jonathan and Petra did at the PHPNW16 hackathon. It’s not quite ready yet, but will be soon. The next blog post that I publish will appear there, rather than my hijacking Mark’s blog again. Then Mark modified my Twitter account so that it uses my new Diversity Elephpant icon rather than Peter Kokot’s original image. It’s sad that I’m not seeing my inspiration there any more; but at the same time it feels good to have the new look icon…. and I think that Peter’s image will appear as part of the banner in due course. And earlier today, Mark ordered some stickers based on the icon that Ashley created for me at PHPNW16, so that he would have them to send to Edinburgh for the ScotlandPHP Conference at the end of October. And if the kickstarter achieves its target, then stickers will be going out with every box of me that is shipped. Which segueys us nicely back to the kickstarter. Now that I’ve arrived (and once Mark has had an opportunity to assess me properly) he will be checking over all his story and rewards again (he’s quite punctilious like that) before submitting it for review next week; and planning to launch it next Friday to run for 6 weeks (42 days). Hopefully that will be plenty of time to meet (and exceed) the funding goal. And I’ll be available as a big elephpant, as well as the standard sized me! It’s a pity that kickstarter insists on all the pledges and funding target being in Pounds Sterling rather than in Euros, given the current exchange rates; although apparently in America all the figures will be converted to Dollars anyway. So everything feels as though it’s suddenly coming together, and Mark has shifted up a gear or two from Light Speed to Ludicrous Speed. Keep your eyes peeled for news of my new webite, and for the launch of my kickstarter next Friday. This post transferred from a post originally made on the blog site at markbakeruk.net on 14th October 2016.